Stephen started by giving an update on the work of the Fundraising Regulator outlining their role and remit and giving some background as to why they were established. The FR will continue to work on the making the Code more accessible and easier to navigate. The key thing is putting the donor first and people having control over their own personal data. GDPR enhances everyone's rights to privacy. Charities need to be able to demonstrate how they comply with data protection principles in their fundraising practices, as well as other activities. The FR has produced bite sized guidance with the Institute of Fundraising on issues relating to GDPR and charitable fundraising. There is other practical help available from the GDPR Library. In addition, NICVA's Data Protection Toolkit is a useful resource for GDPR and data protection areas other than fundraising matters. Part of the FR role is to investigate complaints from members of the public about fundraising. There are some case studies available on the FR website which highlight some of the issues investigated. This is a website-based service (supplemented by a telephone helpline on 0300 3033 517) that can help members of the public control the communications they receive from charities. The public can stop communications from charities of their choice and the charity has 28 days to complete the stop request. If this isn’t done it will be reported to ICO. 40% of suppressions are for the larger charities who have the most transactions with the public. There have been over 16,000 suppressions so far made by just under 6,000 individuals. Around a quarter of the suppressions and those going onto the FPS site are made on behalf of someone else. It is difficult to say exactly but approximately 25 charities in NI fall within the levy (where they have over £100,000 fundraising expenditure a year) and have received a letter from FR. Out of these, so far 13 have paid. The starting rate for the levy is £150. 90% of charities in England and Wales that fall within the levy are paying. Stephen highlighted that registration was a sign of commitment to good practice and that signing up to the Code of fundraising practice. All those registering also sign up to the Fundraising Promise. Once registered you can display the badge which will become more recognisable to the public as awareness rises. FR publish a list of levy payers and non-payers on their website. You can also register if you spend less than £100,000 on fundraising for a £50 annual fee. The website alos shows those registering on this basis as well. In the process of transforming the website and this is planned to be completed by end of July this year. Roisin Foster, Chief Executive of Cancer Focus, spoke about the importance of good governance in terms of fundraising in Cancer Focus and that registering with the FR was a way to show commitment to good practice and compliance with the code. She said that they wanted to have open and honest fundraising and that it was essential to build trust and respect with the public. ‘We registered with the Fundraising Regulator as part of the governance of our charity. Our values include integrity, openness and transparency in all our work including Fundraising. Complying with the Fundraising Regulator’s standards give us confidence that we are both doing the right thing and doing the thing right’. Maeve Colgan, Head of Income Generation, then outlined the various ways in which they fundraise through direct mail, fundraising events/challenges, street collections and so on. They have reviewed all their fundraising practice and all of it is now done inhouse by Cancer Focus staff and volunteers so that they can be accountable for it all. They take any complaints seriously and work hard to ensure the best possible fundraising for the work of the organisation. Frances encouraged us to engage with the FR and urged all boards to consider registering. Some may register others decide not to, but it needs to be discussed by the board of trustees and a rationale for the decision agreed. She said that she was “delighted to have voluntary self -regulation of fundraising in NI”. CCNI have a memorandum of understanding with FR and have a good relationship with them. Frances then highlighted the guidance available in Fundraising for Charities, a guide for charity trustees and the public. She reminded us that the first point of call should be the charity and then the regulator depending on what the issue is – data - ICO, crime - PSNI, CCNI - governance, FR - fundraising. She said that the CCNI would be involved when there are “high level failures or low-level failures on a persistent basis” There are examples of the type of issue that FR deals with and CCNI deals with in the guidance. The CCNI are involved with issues of governance and when trustees are not fulfilling their obligations. Bob referred people to the NICVA GDPR toolkit and said that he had found that there was a lot of general misunderstanding around consent and where it could and should be applied appropriately. It was important to consider the other legal bases that can be used for fundraising activities, though consent is of course a requirement for electronic direct marketing. He also highlighted the importance of ensuring that any third-party vendors (e.g. email marketing or data enrichment services) are also GDPR compliant, and that their values and data protection practices align with your own. It's also important that any volunteer fundraisers are trained in data protection and are aware of your policies and procedures. 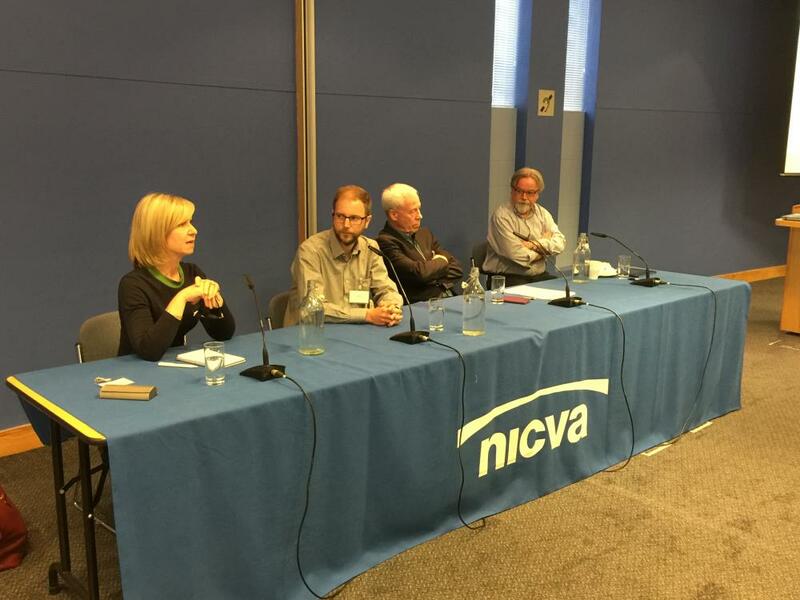 The event ended with a question and answer session with the Panel - Stephen Dunmore, FR Francces McCandless, CCNI and Bob Harper, NICVA. A summary can be found here.